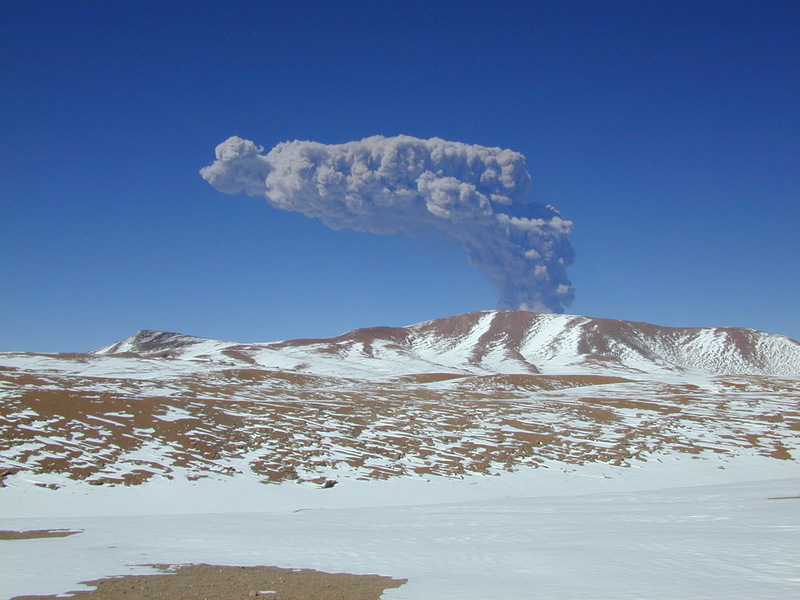 July 20, 2000 The nearby Volcan Lascar underwent a major eruption last week, and was caught in the act by Brian Mason and Tim Pearson! So far, this has not had an effect on CBI operations. (©2000 Caltech/CBI). 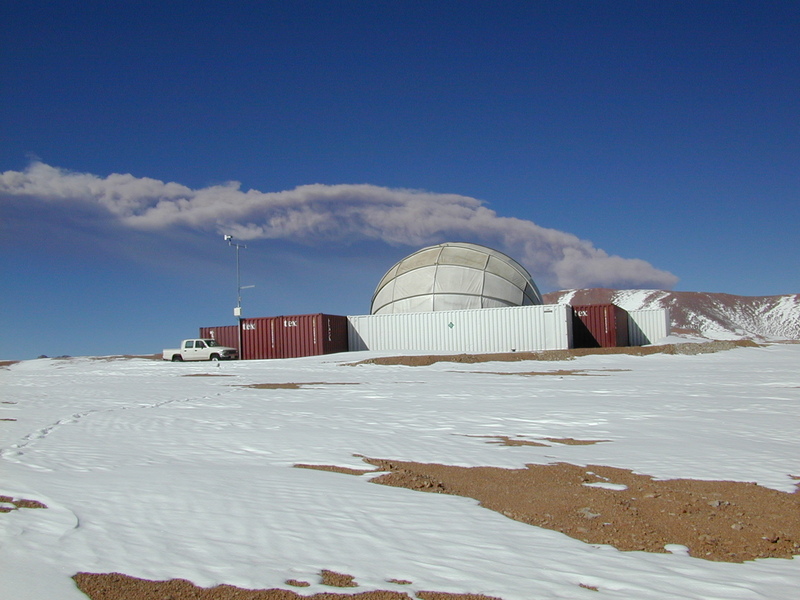 June 2000: The CBI is in the middle of its first winter of operations and so far all is GO! The CBI has been observing since January. (©2000 Caltech/CBI). 14 April 1998: A test raising of the CBI dome. (©1998 Caltech/CBI). 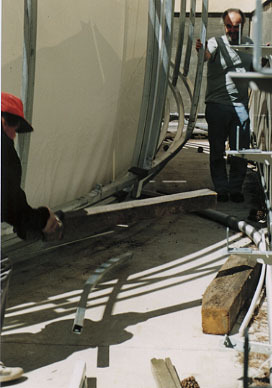 Installation of the sailcloth for the dome is nearly complete (4/15/98). The elevation ball-screw is installed, and the mount is nearly ready for the first pointing tests (3/27/98). 14 April 1998: Tony gives a balky reinforcing tube the patented "Readhead Whack". (©1998 CBI). The CBI is a 13-element interferometer mounted on a 6.5 meter platform operating in ten 1-GHz frequency bands from 26 GHz to 36 GHz. The instantaneous field of view of the instrument is 44 arcmin and its resolution ranges from 4.5 to 10 arcmin. A 9-hour observation with the CBI will yield an image covering a 2�� �� 2�� field with rms noise of 2.4 mJy, which for a 10 arcmin beam corresponds to Delta_T/T = 3 �� 10-6 rms. This is considerably below the level predicted by current theories and found in recent observations. The spectral capabilities of the CBI will be used to look for and separate diffuse foreground synchrotron, free-free, and dust emission from the interstellar medium in our Galaxy. 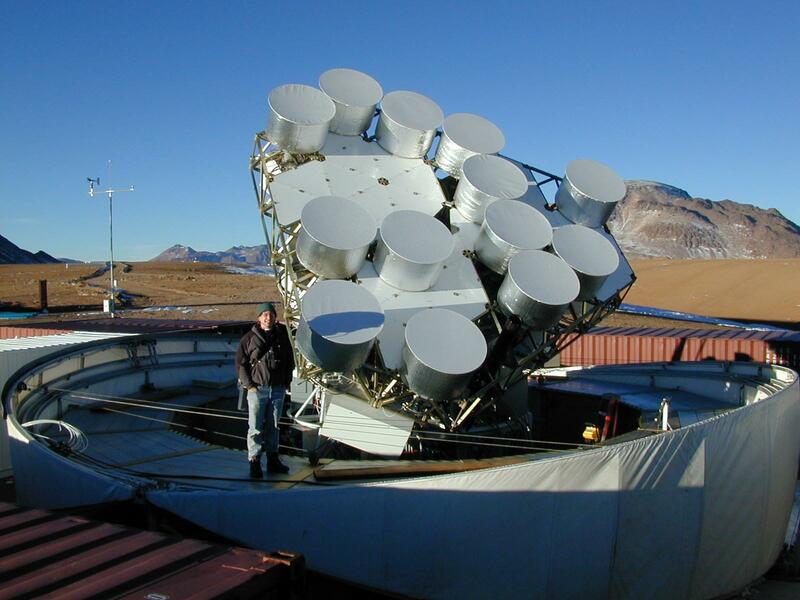 Unresolved extragalactic sources will be measured with the 40 meter telescope at the Owens Valley Radio Observatory, and subtracted from the CBI images. The CBI will also be a powerful instrument for observing the Sunyaev-Zel'dovich scattering of background radiation photons by the hot electrons in clusters of galaxies. Measurements of this effect can be used to study the properties of the hot cluster gas and the evolution of clusters, and to measure the Hubble constant directly. The CBI will be completed early in 1998. 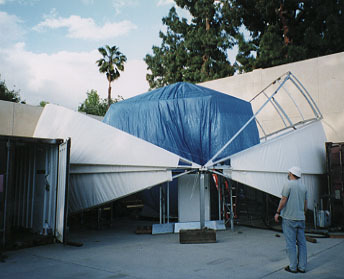 After a few months of tests on the Caltech campus in Pasadena, it will be disassembled and shipped to Chile, where it will be installed at an altitude of 5000 meters. A high, dry site is essential in order to reach the required sensitivity levels in a reasonable observing time. The Principal Investigator for the CBI project is Tony Readhead (Caltech), and the Project Scientist is Steve Padin (Caltech). Other Caltech team members include John Cartwright, Tim Pearson, Walter Schaal, Martin Shepherd, and John Yamasaki. Other collaborators include John Carlstrom, Mark Dragovan, and Bill Holzapfel (University of Chicago), Steven Myers (University of Pennsylvania), and Marshall Joy (NASA MSFC). The construction of the CBI has been made possible by the generous support of the National Science Foundation (award AST-9413935), the California Institute of Technology, Ronald and Maxine Linde, and Cecil and Sally Drinkward.